Atlanta United president Darren Eales didn't look like a man basking in the glow of professional triumph as he paced between the players' entrance and the Bobby Dodd Stadium field on the afternoon of March 5. It was a just a few hours before the MLS expansion team's raucous inaugural match against the New York Red Bulls and the 44-year-old Englishman was far too busy making sure every last detail was taken care of to celebrate the culmination of three years of meticulous planning that went into the club's ballyhooed debut. Eales knew exactly what to expect. The 55,000 in the stands may have raised eyebrows elsewhere -- the crowd was the fourth largest in global soccer that weekend, behind only games in Manchester, Barcelona and Dortmund -- but selling out the opener was never in question after the club moved an astounding 30,000 season tickets in the run-up to its maiden campaign. The dynamic young team on the field displayed its attacking chops but also its inexperience by squandering a 1-0 halftime lead and losing to last year's Eastern Conference regular season champs. But even that was part of what Eales envisioned when he left his job as Tottenham's director of football administration in 2014 for a chance to build from scratch the most ambitious expansion team in MLS history. "Soccer is fun," Eales told ESPN FC. "It's entertainment. I want fans to see an exciting game win, lose or draw." "One, just about every man, woman and child had Atlanta United gear on," Eales said. "The other thing was, they stood up the whole game. The sort of electricity, energy and knowledge of the game far surpassed what I expected. I thought there would be a learning curve for the fans. As an expansion team, I thought it would take a lot more time for people to almost learn about cheering us on. But on day one, it felt like you could've dropped into that stadium and someone who didn't know better would have thought this team had been around for 30 years." 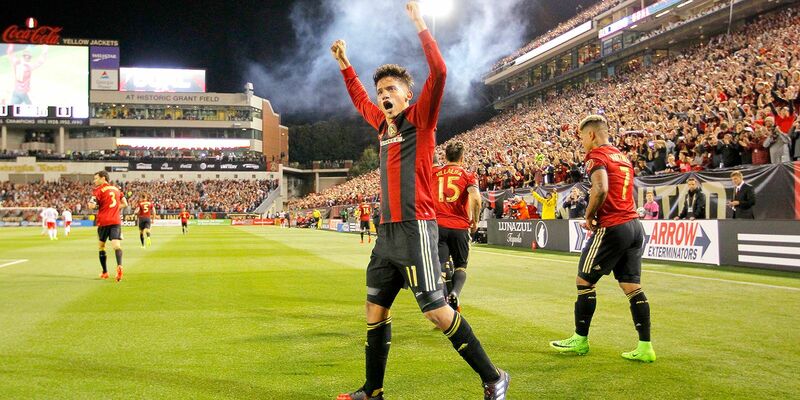 Two months into the new MLS season, a case can be made that Atlanta United's launch is the most successful of a new team in the history of North American professional sports. The Seattle Sounders have made that claim often since arriving in MLS in 2009, with the numbers to back it up. Atlanta's are even more impressive so far. Their curtain-raiser was the third-highest attended among expansion sides, behind Orlando in 2015 and Montreal three years earlier. They're the first team in league history to draw more than 100,000 fans to their first two games. And they've done it in a city that, unlike Seattle or Portland or New York, has little history of embracing pro soccer, as well as a reputation for not supporting its established sports teams. "We never dreamed we would ever have anything like this in Atlanta," MLS commissioner Don Garber said at the opening of the team's $60 million, 30,000-square-foot training facility in suburban Marietta. "[In the past] I kind of looked at Seattle and said 'Maybe that's an outlier, maybe it's just unique to that market.' And here we are in Atlanta, and we have something that's tracking to have a larger fan base -- or at least a season ticket base -- than Seattle had in its first year." Like any other success story, there are a number of explanations. Atlanta has been one of the fastest-growing cities in the U.S. in the past two decades. It's diverse, and it's home to a high concentration of young, college-educated professionals with disposable income, a demographic that has embraced MLS sides elsewhere. "A lot of people in Atlanta are transplants like I am: they moved here from somewhere else," Eales said. "They already had a team in the NFL or NBA when they got here. But MLS is younger and people haven't necessarily built up their allegiances yet, so they see Atlanta United as their hometown club." Part of it surely has to do with soccer's exploding popularity coast to coast, which has seen a number of non-traditional markets -- Orlando and second-tier Cincinnati are good examples -- embrace the pro game like never before. But the biggest single factor in Atlanta United's early success is owner Arthur Blank. "Arthur Blank -- I love that guy," the taxi driver gushed as his car pulled up to the stately Buckhead mansion that houses the billionaire Home Depot founder's business operations, a sentiment that seems unanimous across the city. Inside the building, it's easy to see why. In a room off the main entrance, the longtime owner of the NFL's Atlanta Falcons' approach is emblazoned on a display case in the form of six core values: Put people first. Listen to the customer. Include everyone. Innovate continuously. Lead by example. Give back. They aren't just words to the 74-year-old Queens, New York, native. In February, when the Falcons reached their second Super Bowl, Blank showed his appreciation to the team's 270 employees by taking them to Houston for the big game. Blank and Garber have known each other since the latter's days at the NFL. Blank had been trying to sell the commissioner on Atlanta for a decade before finally getting the go-ahead, after plopping down the $100 million expansion fee, in 2014. The region had long been a youth soccer hotbed -- two members of the U.S. team that reached the 2002 World Cup quarterfinals, Clint Mathis and Josh Wolff, grew up in the area -- but for a long time, MLS was not convinced an expansion team would be a success. "Ten years ago we didn't believe that Atlanta would be the market that it has become," Garber said. "We are where we are because Arthur Blank had the vision to do this." From the start, Blank was committed to hiring the best people available. Eales was an ideal fit. He'd played college soccer at Brown University and was a director at West Bromwich Albion before landing at Spurs. Still, he was skeptical heading into his interview with Blank. "Before I met Arthur, one of my concerns was that I don't want to be that little brother to the Falcons, just a tenant for the stadium without the commitment," Eales said. "I could tell as soon as I met Arthur just how serious he was. "With all Arthur has done for Atlanta, people knew we already had an owner who walks the walk," Eales continued. "He cares about the city, he wants to be successful, and people know he's going to be committed to it. Those 10,000 season ticket deposits we got when the team was announced was solely because of Arthur's credibility." Although Blank was relatively new to soccer -- he met his third and current wife, Angela, through their soccer-playing children from previous marriages -- his sports background helped him get up to speed quickly. Eales was able to persuade him that a world-class training facility was a worthy investment despite the hefty price tag, as it would allow the club to lure players from inside and outside MLS, and to develop their own. The facility, which borrows several design elements from Tottenham's Enfield Training Centre, instantly became the most lavish in MLS. Blank green lit the hiring of former U.S. national team captain Carlos Bocanegra as the team's technical director, then allowed Eales to quickly snap up Paul McDonough, the former Orlando GM, when he became available. The three-pronged leadership structure seemed excessive by MLS standards, but their varying experiences helped Atlanta when it came to building out the roster. But first, they had to hire a coach. Eales had a connection to Gerardo "Tata" Martino, who had led Lionel Messi and Argentina to a runner-up finish at last summer's Copa America Centenario, through Tottenham's Argentine boss Mauricio Pochettino. After he and Bocanegra flew to Rosario, Argentina, to meet with Martino, they came away convinced they could get him. "Darren told me we had this candidate who had been the coach of Paraguay, of Argentina, of Barcelona. I said, 'Sounds great,'" said Blank. There was one problem: Martino didn't speak English. "This is Major League Soccer. We're playing in America. How is that going to work?" Blank asked Eales. Eales eventually convinced his boss that language wouldn't be an issue on a multicultural team. He'd take lessons. Besides, Martino's wife was an English teacher. After Atlanta got its man, Martino's all-world pedigree quickly became the fledgling club's best recruiting tool. Eales had determined that a marquee designated player signing was not required to sell tickets, which were being snapped up in droves. Instead, he set about acquiring lesser-known South Americans who would produce on the field, grow with the club and, if all went well, eventually be sold to European teams for profit that would be re-invested in the roster. Paraguayan midfielder Miguel Almiron arrived first, followed by Venezuelan forward Josef Martinez, They joined Argentine midfielder Hector Villalba, who signed on last summer. Each player was 22 at the time. Going young was risky. With just three DP slots available, the club had to get it right. Eales, Bocanegra and McDonough did their due diligence on each player. "Miguel is fantastic on the ball and can pick out a pass from pretty much anywhere on the field, but he'll also sprint back 40 yards and slide tackle a guy to poke the ball away," Bocanegra said. "We wanted to have two-way players that have the quality, the technical ability, the pace and stamina to go forward all game, but who also have the fight to run back and defend and help the team. Nowadays in MLS, it's a two-way game. You can't have luxury players on the field." In a club trying to build a culture, character was as important as ability. Eales' vast network enabled him to consult England national team goalkeeper Joe Hart about Martinez, then Hart's teammate with Italian club Torino. The deal was done only after Hart gave Martinez the person a sterling review. Martino was already familiar with compatriots Villalba, defender Leandro Gonzalez Pirez and forward Yamil Asad, who was signed on loan from Argentine club Velez Sarsfield. He also knew MLS better than Atlanta's brass could have hoped for. Eales had legitimate fears about Martino's ability to adapt to MLS's byzantine player acquisition rules -- foreign coaches have struggled historically in the domestic league -- but they were assuaged when Bocanegra discovered that Martino had compiled a dossier on every team. "He'd done an incredible amount of work before Carlos and I ever met him," Eales said. "Like most coaches who get to that level, he's a soccer junkie. He understood what he was getting into." That meant Martino didn't need to be told that finding proven MLS players to complement the imports would be crucial to his team's fortunes. After poring through film, he identified Columbus Crew SC defender Michael Parkhurst as a must-have, so the club traded for him. Right-back Tyrone Mears arrived fresh off an MLS Cup win with Seattle, and journeyman midfielders Jeff Larentowicz and Jacob Peterson signed on as free agents. "It was a no-brainer," Larentowicz, a 13-year MLS veteran who played for no-frills organizations in New England, Colorado and Chicago before spending last season with the LA Galaxy, said of his decision. "They hired Tata, and it was like if they want me to go there, I'm going." It's all added up to a respectable 3-2-2 start that included a 6-1 smack down of Minnesota in the fellow expansion club's first home game; a 4-0 win over 10-man Chicago; ties in Seattle and Toronto, two of the toughest road trips in the league; and last weekend's 3-1 win at Real Salt Lake. They might have eked out a result in Montreal two weeks ago, too; they lost on a stoppage-time goal after Pirez received a first-half red card, a decision that was later overturned on appeal. The playoffs, which no expansion team has qualified for since the Sounders did it eight years ago, are a realistic target. "In every game that we've played, the team has been up to the level of competition," Martino told ESPN FC. "But we also know that we're still improving, and to reach the high goals that we have, the team is going to have to continue to get better." Despite the good vibes, there have been some growing pains along the way. And the club's move into $1.6 billion Mercedes-Benz Stadium has been pushed back almost six weeks because of construction delays, with the team now targeting an early September move-in date. According to Mike Gomes, senior vice president of fan experience for both United and the Falcons, the wait will be well worth it. "This wasn't a football stadium that we figured out how to retrofit for soccer," Gomes said of the 71,000-seat venue, which will be downsized for MLS games unless demand for tickets remains sky high. "Darren and our soccer leadership were very involved with several aspects of our stadium design," such as the steep rake of the seats in the supporters section behind the east goal, which will produce a wall-like effect reminiscent of the one at Borussia Dortmund's Westfalenstadion. The downtown venue is near a transit hub; the Falcons, which played at the soon-to-be demolished Georgia Dome next door, had more fans travel to their games via public transportation than any other NFL team last year. The food inside will be dirt cheap, too, at Blank's insistence. "No longer are we going to charge $5 for a soda," Gomes said. "We wanted to approach pricing for food the same way that you would expect if you bought it out of a convenience store. Two-dollar hot dogs and three-dollar pizzas, without a reduction in portion size. Unlimited refills on $2 sodas. Nobody does that. It's an industry game-changer." The arena, which features a retractable roof, makes Atlanta a shoo-in for World Cup matches if the joint bid between Canada, Mexico and the U.S. for 2026 is successful -- not that Eales and company are thinking that far ahead. As far as Atlanta United's leadership is concerned, the process of building their club has only just begun. "Back in England, clubs have been around for 125 years," Eales said. "Here, our fans are on this journey with us from the beginning. They feel part of it. They're emotionally attached. To start something from scratch was exciting. "You inherit your hand a bit at a club like Spurs. Here, you've got a chance to change it." In doing so, Atlanta United has already upped the ante. Doug McIntyre McIntyre is a staff writer for ESPN The Magazine and ESPN FC. Follow him on Twitter @DougMacESPN.